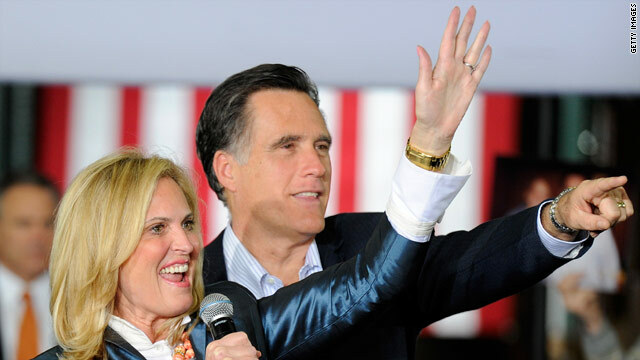 (CNN) - The wife of former Republican presidential nominee Mitt Romney said she and her husband have moved on from last year's election. "We don't look back," Ann Romney said in an interview with CNN's Wolf Blitzer airing on the "Situation Room" Wednesday. "Neither one of us ever look back." (CNN) – Ann Romney said she and her husband, 2012 GOP presidential nominee Mitt Romney, had their shot at the White House and it's now time for others to take on the challenge–but didn't totally rule out another run for office. "We had our turn, we gave it our all," she said in an interview that aired Monday on CNN's "New Day." "Now I feel like it's time to pass the baton on to someone else…I'm looking at my children and I'm thinking they've got to step up. Other generations have to now step up and take over." Park City, Utah (CNN) - As Mitt Romney begins to re-emerge into the public spotlight with a Utah conference, the former Republican presidential nominee told CNN Chief Political Analyst Gloria Borger he was disappointed with President Obama's pick of UN Ambassador Susan Rice to be his next national security adviser. "I find that a disappointing appointment on the part of the president. I think what she did was to very seriously mislead the American people about what happened in Benghazi. My greatest concern about the Benghazi events was the fact there was not a rescue effort attempted and that is very troubling to me," Romney said. You can watch extended excerpts of CNN's interviews with Mitt and Ann Romney on “The Lead” at 4 p.m. ET and “The Situation Room” at 5 p.m. ET and 6 p.m. ET. (CNN) – No presidential campaign is perfect, Ann Romney admitted Thursday - even her husband's bid for the White House in 2012. Speaking solo for the first time since November's election loss, Romney said on CBS she had no personal regrets from last year's effort, but conceded there were things everyone would have liked to do differently. Washington (CNN) – After choosing not to attend his former rival’s inauguration, Mitt Romney, along with wife Ann, is headed to Washington at the end of the week. The pair will attend a reception in their honor Friday hosted by philanthropist Catherine Reynolds and businessman Bill Marriott Jr., according to a former aide to the governor. (CNN) - Ann Romney opened up about her struggles with multiple sclerosis while speaking Saturday with patrons at a restaurant in Fort Lauderdale, Florida. The wife of Republican presidential nominee Mitt Romney shared some of her personal experiences when she met a woman who also suffers from the nervous system disease. (CNN) – Ann Romney, the wife of the GOP presidential nominee, took to "The View" Thursday to talk up her husband as an advocate for women, though she wouldn't get into many details about her own political positions. Asked whether she, like her husband, had changed her stance on abortion, Ann Romney demurred. 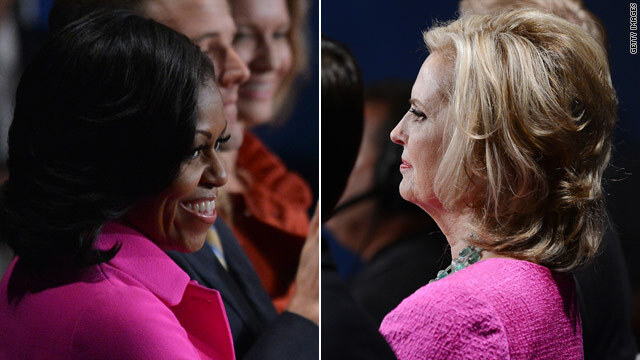 (CNN) - Michelle Obama and Ann Romney's dresses drew attention at Tuesday's presidential debate first for their color, and second for the statement they may have made. While their husbands clashed spectacularly onstage, Obama's and Romney's dresses bore more in common than one might expect of people with their two last names.